Gardeners are a mixed group of people with a wide variety of gardening interests. Some gardeners are strictly interested in ornamentals and flowering plants while others are solely interested in vegetable gardening. There are also those of us who dabble in everything. While you prepare your garden beds for planting this year, consider integrating vegetables into your planting scheme along side flowering annuals and perennials. Many vegetables plants have desirable foliage characteristics such as: size, shape, color, texture in addition to the added bonus of being edible or producing an edible fruit. The main ingredient needed to successfully integrate vegetable plants in a planting scheme is sun. Most vegetables require a minimum of 6 hours of direct sun. Too much shade will result in poor flower production, poor pollination, and increased susceptibility to disease. Vegetables also require moist well-drained soil. Our heavy clay piedmont soils should be amended with compost prior to planting and vegetable will need to receive an average of 1” of water per week. When planning to integrate vegetables into an ornamental planting scheme consider the size of the plant, the shape and texture of the leaves, as well as the color of the leaves, flowers or fruit of the plant. Remember that some plants are harvested before they flower, such as cool season leafy vegetables – cabbage, spinach, lettuce, and kale. These vegetables can be incorporated into plantings twice a year in March and August. Red cabbage or red lettuce for example can be easily group and planted on a 12” x 12” grid grouping mixed with ‘Homestead Purple’ (Verbena canadensis), ‘Little Miss Muffet’ shasta daisy (Leucanthemum x superbum), ‘Pink Cloud’ muhley grass (Muhlenbergia capillaries), and a variety of Iris species. When a nice combination of plants is repeated in an annual or perennial boarder, the result is interesting, balanced, and harmonious. When the cool season vegetable is harvested it can be replaced in the landscape with another vegetable of similar size, such as summer squash that will integrate well with the other plantings. 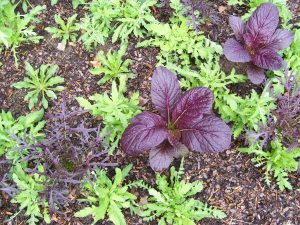 While mixing vegetables into a flowerbed add excitement and interest to a planting, not all vegetables can easily be integrated. Sweet corn for example, is wind pollinated. In order to guarantee good pollination of corn, it is typically mass planted in rows. Other vegetables may require training and trellising, such as tomatoes and cucumbers. While a series of teepee trellises can be erected around the garden, it may be easier to put these in a container and place them where they can be easily accessed. Mixing vegetables and annual flowers in containers is another fun way to incorporate a little magic in the garden. When container gardening, remember to always make sure your container of choice has a drainage hole in the bottom. If the container is light-weight a little gravel on the bottom will help to prevent it from tipping over. Always use soilless media, a soil used for growing plants that contains no actual soil. Instead, it is made up of a combination of organic and inorganic materials as opposed to soil from the garden. This will reduce chances for a soil borne disease in the container. 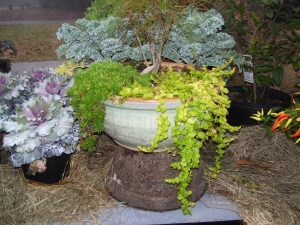 Container gardens should include 3 types of plants: A thriller, a filler, and a spiller. The thriller plant is typically an upright vertical plant. The filler is a plant that is typically horizontal and spread out, and the spiller is a plant that cascades over the sides of the container. A nice mixed container planting could include: A tee pee trellis trained with a tomato plant of your preference (the thriller), periwinkle (Catharanthus roseus) the filler, and edible sweet potato vine (‘Porto Rico 198’, ‘Jewel’, ‘Pope’) the spiller. Mixing edible vegetables into an ornamental garden border adds another dimension to your garden. It allows you to eat what you grow. There is certainly no limit to the combinations of different plants that could be introduced to your garden. For more information on home vegetable gardening go to www.ces.ncsu.edu/depts/hort/hil/ag-06.html or www.ces.ncsu.edu/durham/agriculturehorticulture/mg/flowers.php for information on growing annuals and perennials. Michelle Wallace is the Consumer Horticulture Agent for the North Carolina Cooperative Extension Service in Durham County. She is a graduate of NC State University with a BS in Horticulture and a Masters in Landscape Architecture. You may contact her at 919-560-0525.